Henry Duncan Preston Cunningham R.N. J.P.
Henry Duncan Preston Cunningham was born on the 29th June 1814 in Cornwall, the second son of Dr John Cunningham R.N. who was a surgeon in the Royal Navy. (He was Surgeon of the Veteran at the surrender of the Dutch fleet in the Texel in 1799, and at Copenhagen in 1801; and in the Gibraltar at the attack on the French fleet in Basque Roads in 1809. He was married to Amelia, daughter of Dr Alexander Young, R.N., ‘a talented and meritorious officer who was for many years Surgeon of George the Third’s yacht’). 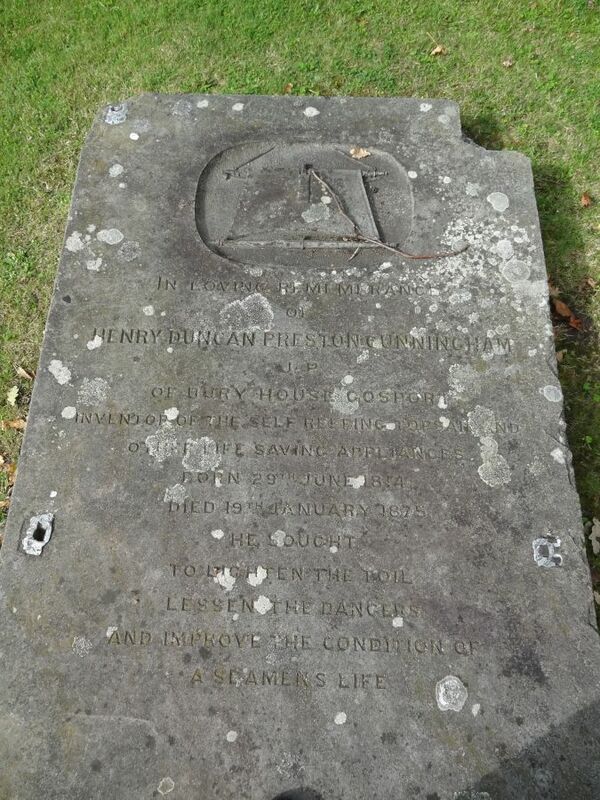 Henry Cunningham entered the navy in 1830 serving on the ship Donegal as a first class volunteer. He then served on the ship Pallas where he gained early distinction by undertaking single-handed the dangerous and arduous task of surveying the carefully guarded defences of the Dardenelles. He produced detailed drawings for the Government. In 1835 he moved to the civil line of the navy and qualified for the rank of Paymaster (equivalent to the rank of Captain). In September 1838 he was appointed secretary’s clerk under Sir Robert Otway, then Commander-in-Chief at the Nore. He served in the same capacity under Sir William Parker and in 1841 he went with him to China and took part in various operations in that war. In the attack on the entrenched camp at Segoan on 15th March 1842 he was ‘one of the foremost in the assault’ displaying conduct that earned him a mention in reports for ‘conspicuous gallantry’, as well as in a special letter written by Sir William Parker to the Admiralty. He was present at the attack upon Chapoo, the batteries at Weosung and the town of Chin-Kiang-Foo and the pacification of Nankin. In 1842 Mr Cunningham was the supernumerary paymaster of the Cornwallis flagship and was confirmed in the rank in September 1842. In 1845 Mr Cunningham was appointed secretary to the Commander-in-Chief at the Cape, Rear Admiral Dacres, on board the ship President. He arrived at the Cape at the outbreak of the Caffre War. He served in the boats in an attack on a fortified position on the Angoza river, again being given a special mention in dispatches. He took a prominent part in negotiations with Queen Ranavalone of Madagascar and made himself acquainted with the language of the country for the express purpose of conducting a treaty with the Queen. His knowledge of the political affairs and history of Madagascar was brought to the attention of the Government. Cunningham became famous for the invention of the self-reefing topsail, which he manufactured in the Gosport Foundry at The Green (the site is now a car park at the ferry end of Minnitt Road). The agent for this invention was William Henry Lapthorn, sail maker, ship chandler, of 29 Broad Street Portsmouth. The self reefing topsail was exhibited in a model of a fully-rigged ship at the Great Exhibition in 1862, amongst the section on Naval architecture and Admiralty models. "They roll up like common blinds, and almost entirely obviate the necessity of sending men aloft." In the 1862 International Exhibition Cunningham was a medallist and juror. The self-reefing topsail, earned him the popular title ‘patent-topsail-Cunningham’ in naval circles. According to the Hampshire Telegraph by May 1856 it had been fitted to 'upwards of one thousand ships' lessening the dangers to seamen in unfurling and furling topsails in bad weather. 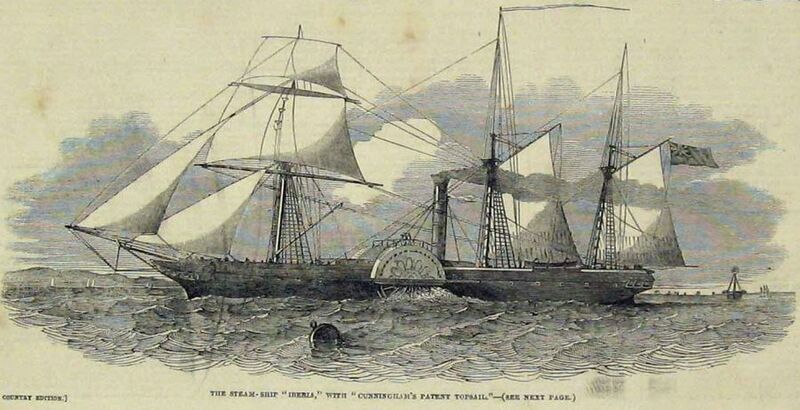 In 1851 the steam/sail ship Iberia building in New York was fitted with Cunningham's patent topsails to compete against the British yachts at Cowes. In 1862 it was fitted to the ram ship Resistance. It allowed the crew of a ship to operate the topsails from the deck of the ship, without going aloft. This admirable invention met with immediate and widespread recognition, thousands of vessels of all nations being fitted with it. It marked, in fact, a new era of improvement in the fitting and rigging of ships, and gave the first impulse to the many valuable devices for economising labour which have since been made. The mercantile marine hailed it at once as the solution of an old and difficult problem, increasing in a high degree the ease and safety of manoeuvring ships, and effecting an enormous saving both of time and labour; whilst the extent to which it diminished the discomforts and dangers of a seafaring life, gained for it, amongst seamen, the honourable title of the "Sailor's Friend." His patent was described in The Times of December 20th 1864 during a court case where the patent was disputed: and Mr Cunningham was the plaintiff. The general principle of the invention was based upon what was termed by one of the witnesses "Automatic rotation" or the Bandalore toy; in other words, the result was produced by causing the yard to revolve as it descended by the force of its own weight, and wind the sail upon itself. This was effected by fixing a metal boss (or pulley) in the centre of the yard, so that both yard and the boss must revolve together. By an arrangement of the topsail tie, when the yard was lowered by slackening out the tie, the boss and yard revolved as they descended, and the sail was rolled round upon the yard, the motive power which effected this double action of descent and revolution being the weight of the yard with the sail and appendages attached. To facilitate the operation of winding round the yard the sail was fitted with a slot or opening reaching down to the close reef. 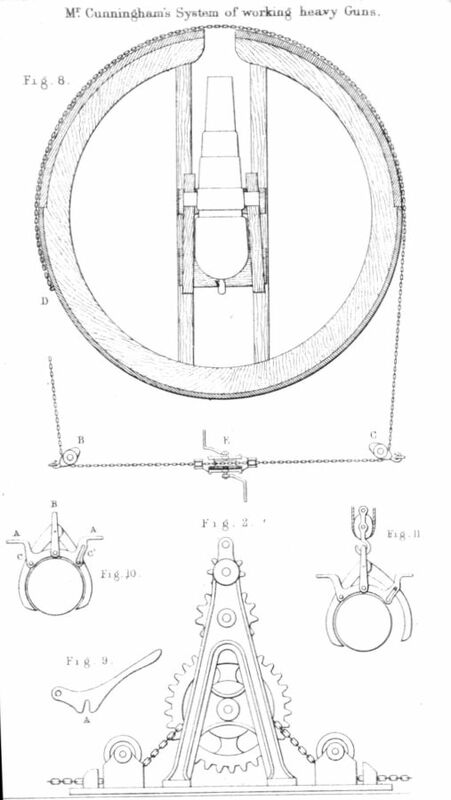 The operation of furling was not comprehended in the plaintiff's patent and the process was not applicable to courses or lower sails bent upon a fixed yard. The invention, which was capable of being performed very rapidly in five minutes by one man on deck proved very successful, and has been largely adopted in merchant ships. 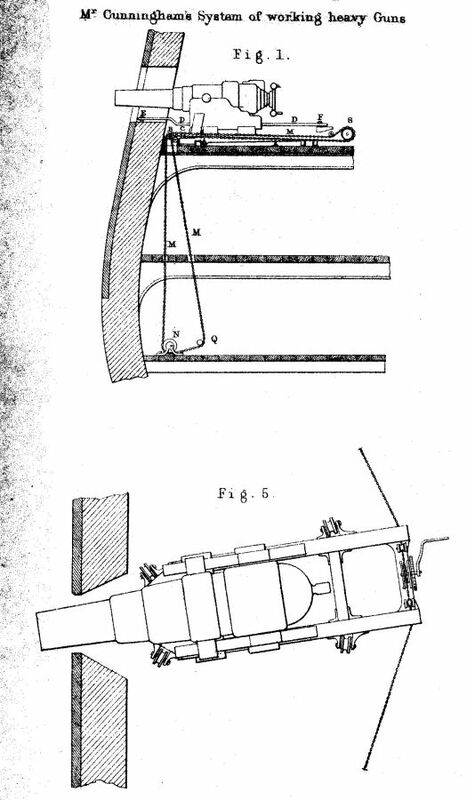 In May 1862 he demonstrated, in Weevil Lake, off the Royal Clarence victualling Yard at Gosport, his system for protecting the screw of war ships from ‘fouling by the wreck of spars and rigging shot away and falling alongside in action, or from having hawsers towing overboard in the vicinity of the screw’. The demonstration was ‘most satisfactory’ and was ‘reported upon to the Lords of the Admiralty’. He demonstrated this protector by fitting it to his small schooner yacht and sailed it in the camber of Portsmouth Dockyard to illustrate the principal. Hawsers were passed under her bottom and round her stern with the screw in motion. The experiment was declared to be ‘quite successful’ and he next proposed to test it outside the harbour with floating gear to represent wreckage and rigging alongside the vessel. Cunningham also invented eccentric paddle wheels with entire shafts, four-way port steam valves, the direct action steam engine, the reefing paddle wheels, a lifeboat, a lifeboat carriage (for which in 1849 he was awarded a medal by the Society of Arts). For the Military he designed overhead shot railways, chain traversing gear, atmospheric gun carriages, sling shots and racks (for Naval use). His ‘brace machines’ and ‘continuous braces’ also greatly reduced the labour needed in operating a ship. In 1861 he bought the Gosport Foundry and warehouse by auction, presumably to continue the manufacture of his inventions. Cunningham was an associate of the Institute of Naval Architects and was a member of various scientific societies in whose journals, such as those of the Society of Arts, Institution of Naval Architects, and Royal United Services Institute, many of his papers on maritime and engineering subjects can be found. 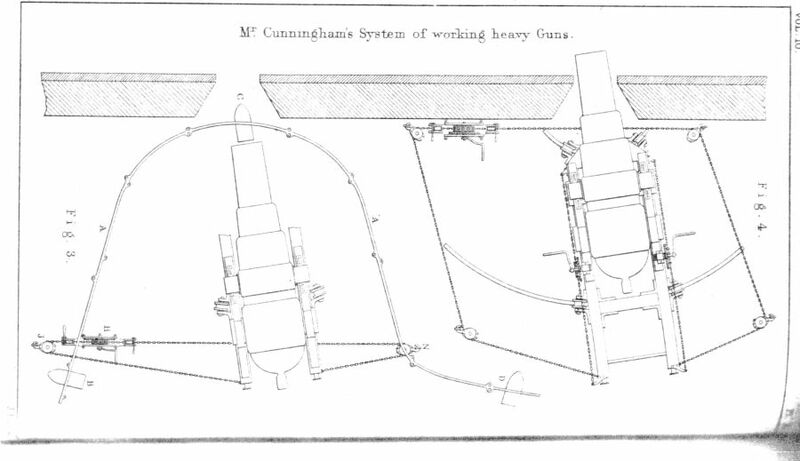 Cunningham devised easy methods of working heavy guns for coast defence batteries and on board naval ships. 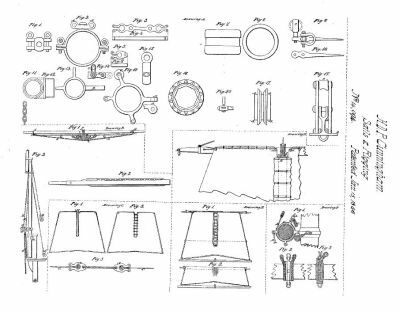 On October 17 1862 his invention of "improvements in working the guns, and in performing other necessary work on board ships, and in apparatus employed therein" was announced in the London Gazette. A trial was conducted, with the permission of the Admiralty, on board HMS Excellent where Cunningham fitted a 9-inch 12ton gun with his traversing apparatus. It was found that two men could traverse the gun easily from extremes of right and left in nine seconds. "Indeed, where the machine was first placed, a boy of 14 years old actually moved the gun round with ease." 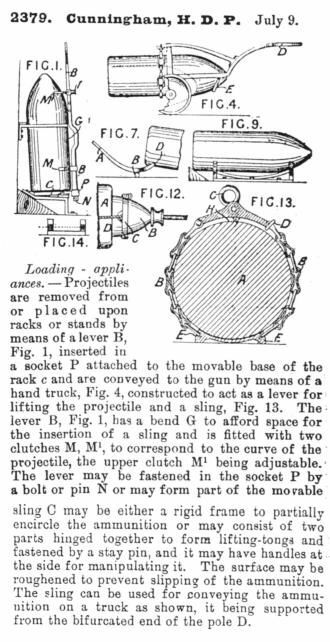 The gear was fitted and used in less than an hour which allowed the gun to be moved to a different port or ship,"the training gear can go readily with the gun, and be in working order before or as soon as the gun is got into position, which impromptu movement cannot be accomplished when preparations of a structural character have to be entered into" as with the existing system of traversing guns. H.D.P. Cunningham with his traversing gear circa 1868. Cunningham greatly assisted the naval architect Captain Cowper Coles, R.N. in providing chain traversing gear for working the turrets of the Royal Sovereign and by his application of steam to all the movements of heavy guns. 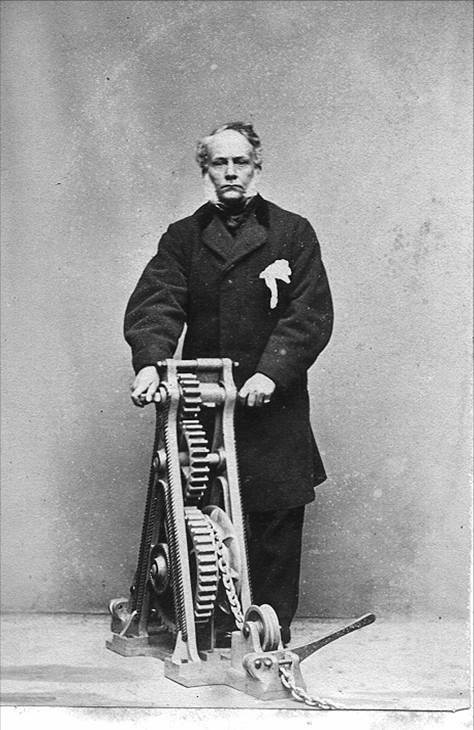 In 1866 he was asked to fit his chain traversing gear to an Armstrong 600 pounder gun at Shoeburyness testing ranges. He also fitted his shot carriage and slings. Cunningham stated in a lecture to the Royal United Services Institute in 1870 (Working Heavy Guns and Projectiles) that "The improvement in loading this gun from the adoption of my plan was very great. Before this, the labour and time in getting the projectile to and putting it into the gun, were excessive, and the length of time a number of men were collected about the muzzle, getting the shot into the bore, exposed them much to shot entering the port. With my arrangement, two men can bring up the projectile, hoist it up, convey it by the railway to the muzzle of the gun, and put it into the bore. In experimental practice, around was fired in 2½ minutes. I consider I did great service in the provisions I prepared for this gun." Cunningham fitted his traversing gear to a gun at Southsea Castle and demonstrated it to the military authorities. It was subsequently adopted by the German Government for coast defence guns. In 1867 several members of the Ordnance Select Committee watched Mr. Cunningham demonstrate his new traversing gear at Fort Gilkicker. The guns at Fort Gilkicker were crowded, with little room between them to allow safe and efficient traversing in action. Once Cunningham’s traversing gear was fitted the Committee were impressed by the speed at which the guns could be traversed. In a previous demonstration a 9-year old boy, who happened to be watching, was found to be quite capable of moving a gun over the arc of training with quite sufficient speed under the conditions. Guns could now be traversed from extreme right to extreme left by two men in 62 seconds. During the trials the Committee also tested the new ‘Shell Carrier’ proposed by Captain Cunningham. This consisted of a clip sling, which was readily fitted on the shell when in a horizontal position, and a small truck on a pair of wheels, having two hooks which hooked into eyes on the sling. By bearing down on the handle of the truck the shell could be easily raised off the ground, and run along the floor by a single man. 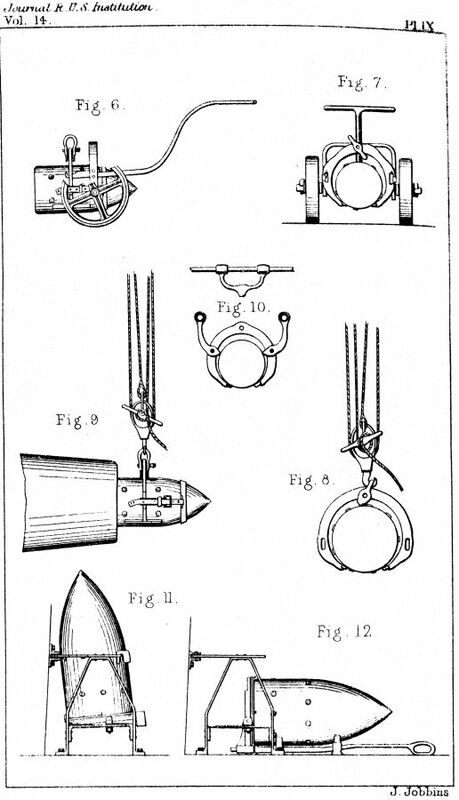 When it arrived near the muzzle of the gun, the sling was attached to the tackle on the traveller, the shell was then hoisted and transferred to the muzzle of the gun, into which it was entered a short distance to give it support, so that the sling could be detached and taken back for another shell. Each shell weighed 250 pounds and normally required four men to move it from the top of the lift to the gun on an ordinary shell bearer. Cunningham attended the 1868 trials of the guns at Fort Gilkicker because in 1858 he had been informed that the Secretary of state for War had adopted his new system of traversing guns for all land service guns of 12 tons and upwards. His new traversing gear consisted of a chain upon which a toothed gear mechanism acted to winch the gun around. This new method allowed the guns to be trained to the full extreme and required only two men as opposed to ten men for the old method. Cunningham was present at Gilkicker when three training tackles of the old block and rope variety were destroyed in one morning’s exercise. His new gear with its galvanized chain was imperishable and he remarked that a gun fitted with it would be ‘serviceable for one hundred years’! The guns could be fitted with this new gear without them having to be removed from their position to a factory. 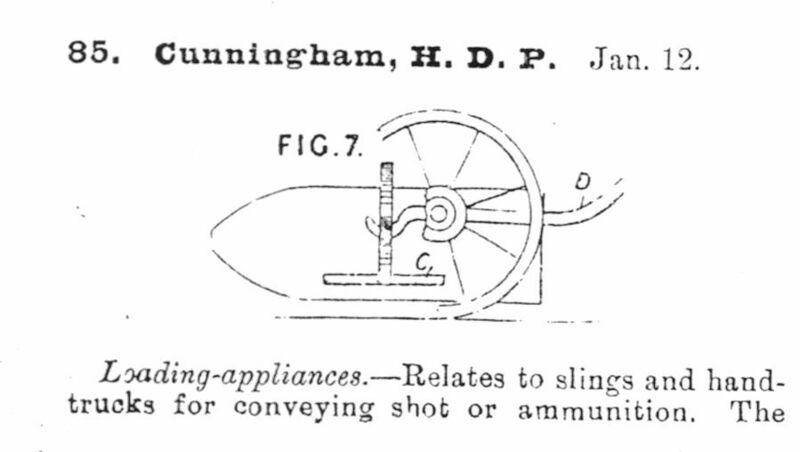 In 1873 the Cunningham shot rack was fitted to H.M.S. Thunderer. It had previously been employed in the Royal Naval ships Monarch, Devastation and Glatton. The previous method of manipulating projectiles required a powerful tackle and six men to lift a 700lb projectile onto the rack, the operation needing two minutes and taking out the projectile required about half that time. With the Cunningham rack two men could lift and place the same projectile in five seconds, and remove it in the same time. 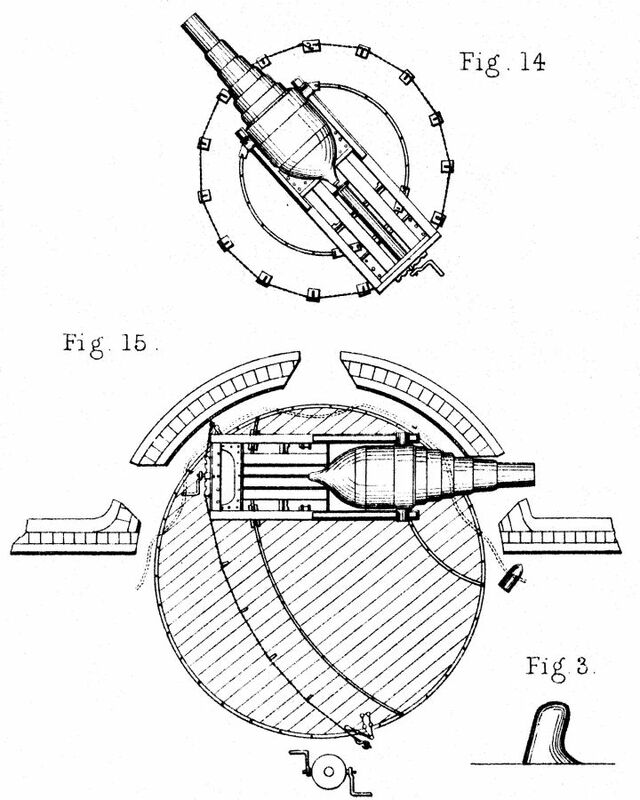 The Cunningham shot carriage could convey the projectile to the turret loading port in 10 seconds. In 1861 Cunningham, as Chairman of the Gosport and Alverstoke Corps of Volunteers presented the corps with a handsome eight-day time-piece to place in the market-hall for the regulation of their drills. The corps had a practice ground adjoining Stokes Bay. Cunningham was amongst the first eleven men to put his name forward as a volunteer in 1859 for the 6th Hants Volunteer rifles but transferred to the Artillery Volunteers shortly afterwards. He became a Captain (July 1861) and then a Major (13 December 1870) in the 3rd Hants Dockyard Artillery Volunteers. The 3rd Hants (Dockyard) Artillery Volunteers was composed entirely of civil servants or ‘dockyard citizens’. They had a band which was often acclaimed in the local news. Their H.Q. and drill shed on Governors Green Portsmouth was opened on 26 August 1865. The 6th battery of the 3rd Hants was based in Gosport and assembled regularly at Gosport under Captain H.D.P. Cunningham J.P. travelling across the water to Portsmouth for drill and parades. 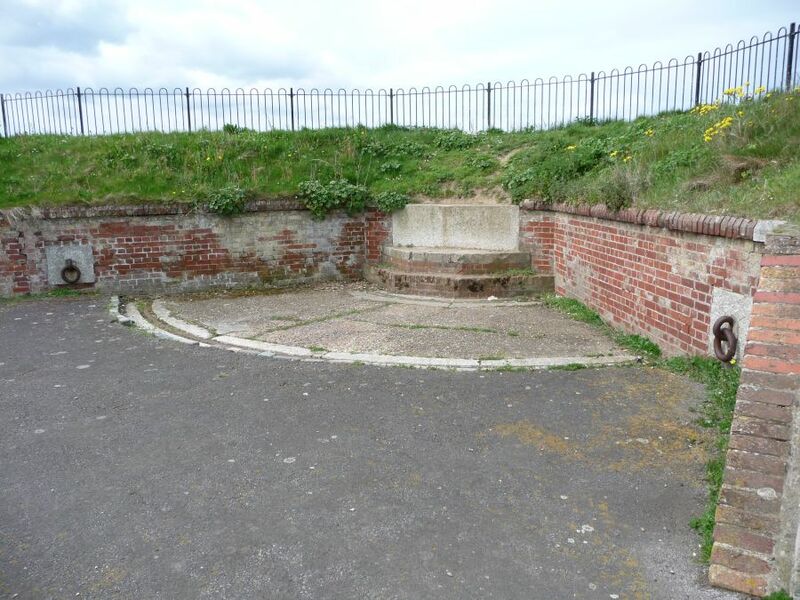 In 1869 this battery took second prize in a competition firing 32 pounders at Lumps Fort, Portsmouth. On Tuesday 18 May 1870 the Gosport volunteers drilled at Portsmouth on Governor’s Green during which a serious incident occurred. On 7th December 1870 Cunningham gained a Certificate of Efficiency at the close of the second course of instruction for Volunteer Artillerymen held at Artillery Institute at Woolwich. In 1856 Mr Cunningham opened an Industrial Class for Nautical Instruction in connection with the Gosport Ragged School. Cunningham proposed to take twelve boys of the town school of the age of thirteen years and upwards devoting time on Thursday evenings at the school to teach them the art of knotting, splicing, seizings, hitches, bends, clinches and the use of compass. When he had succeeded in making them thoroughly acquainted with this part of the instruction he was to transfer them on board his yacht ‘Alfred’ where they were to undergo a thorough course of training relative to the practical portion of their education; reefing, furling, steering, rowing, heaving the lead, the log. By these means ‘a boy who has undergone this course of training is qualified to enter the merchant service’. Cunningham proposed an examination of the boys and to award a certificate signed by several Captains of the Navy to those who successfully passed. This was all to be funded by Mr Cunningham himself. On Wednesday December 3rd 1856 his course of instruction was brought to a close when the boys undertook the examination and were presented with their certificates in the presence of ‘several nautical and other gentlemen’, enabling them to obtain situations in Her Majesty’s or the Merchant Service. Mr Cunningham lived in Bury House, Gosport from at least 1851 (his topsail patent dated 1854 gives his address as Bury, Hants). From 1862 he was well known in Gosport as a local Magistrate (appointed County Magistrate July 6th 1861) serving for fourteen years (until his death) and delivering justice to all manner of local miscreants as frequently reported in the local news. As local chief magistrate he greeted the newly-wed Prince of Wales on his return from honeymoon at Osborne in 1863. He was one of the founders of the Portsmouth Sailors’ Home and a benefactor of the Gosport Army and Navy Institute. He occupied the chair in 1870 and “if not the originator was most prominent in securing its establishment, and became responsible for £200 and two year’s rent in order that the institution might have a beginning, and whether he was looked upon as a soldier, a sailor, or a volunteer, he was certainly the best friend the Institution had.” Cunningham was also the Chair of the Gosport and Alverstoke Young Men’s Christian Association presiding over lectures and recitals of sacred music that were delivered at the “Star” assembly rooms, Gosport. Cunningham was a supporter of the South Street Ragged and Free School with which was connected with an industrial home for poor boys, a seaman’s and poor peoples Bethel and a girl’s free day school. He was elected to the Gosport Paving Trustees in 1874 not long before they became part of the Alverstoke Local Board. 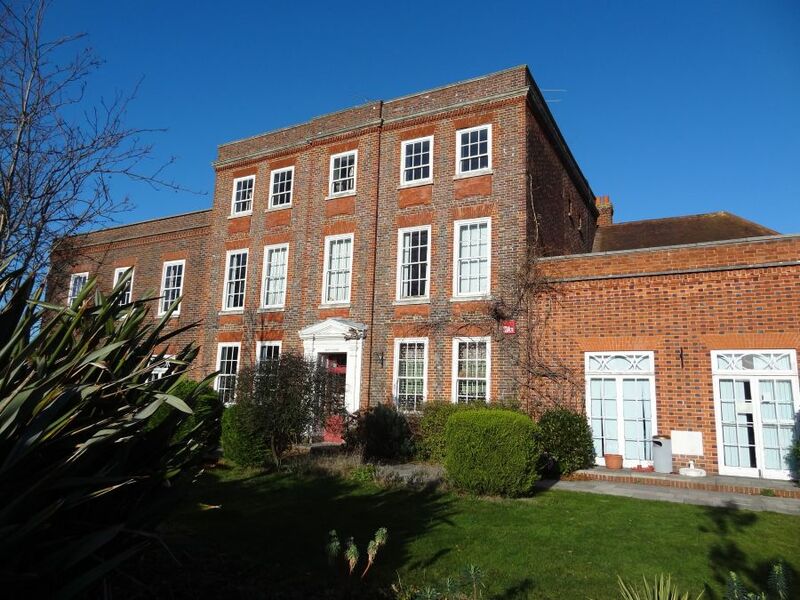 He was prominent in attempting to get the government of Gosport and Alverstoke brought together under one authority which came to pass in 1874 with the formation of the Alverstoke Local Board. 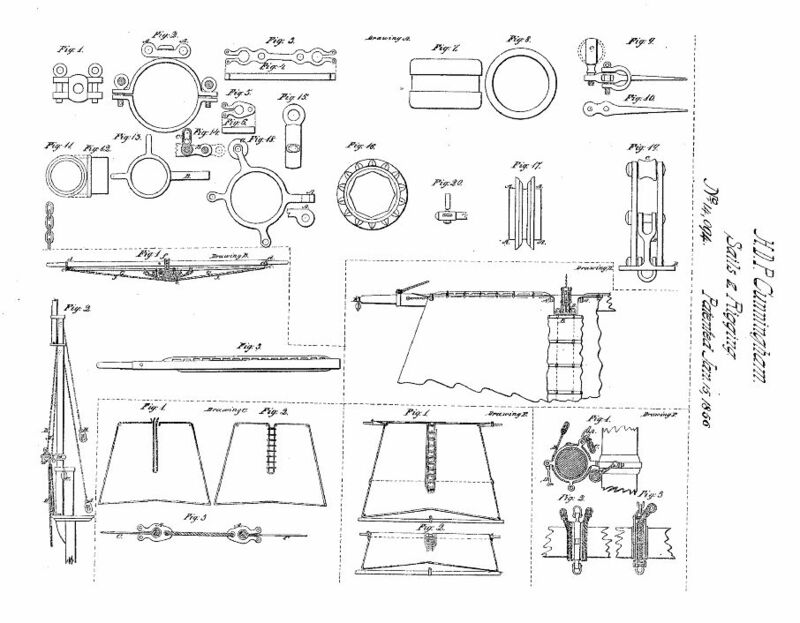 On July 23 1872 Cunningham lodged a patent in the US office for an improvement in carving 'Fork Guards'.
" I Henry Duncan Preston have invented or discovered a certain new and useful improvement in Fork Guards ... My invention consists in constructing the guards in forks so that they shall come up to the guard by the action of a balance-weight or counterpoise..." Probably not one of his best inventions! Cunningham died suddenly on January 19th 1875 aged 60 years. The local news reported that he had suffered, at times most acutely, from heart disease and his death was attributed to this. He was buried in the churchyard of St. Mary’s Church Rowner on 23 January 1875. His gravestone can be found, not in the graveyard but on the green at the front of the church. It is adorned with a small carving of his famous self-reefing topsail. 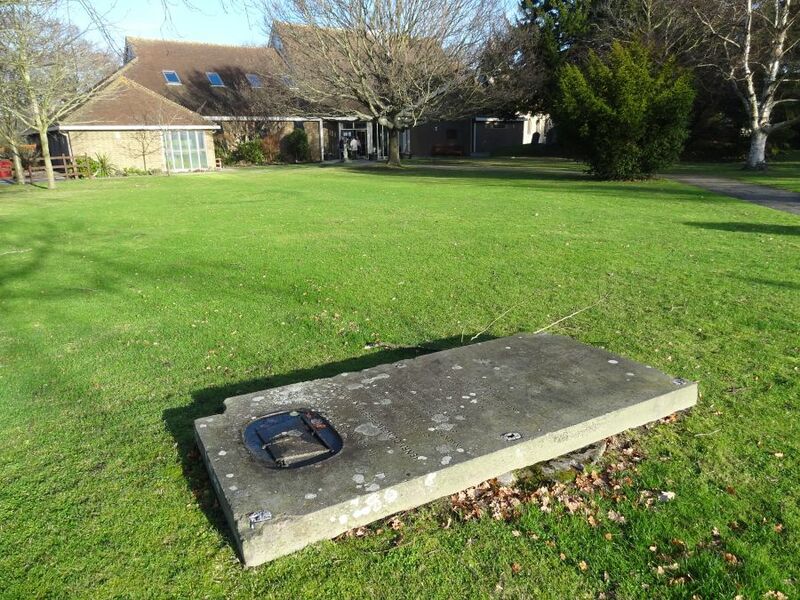 It is shame that someone who made such a major contribution to the people of Gosport and to the safety of mariners worldwide has had his resting place disturbed and his memorial unceremoniously plonked down, minus its railings, as a capping stone to a well with no thought to its original purpose. H.D.P. Cunningham had three children. Henry Hutt Cunningham Q.C. 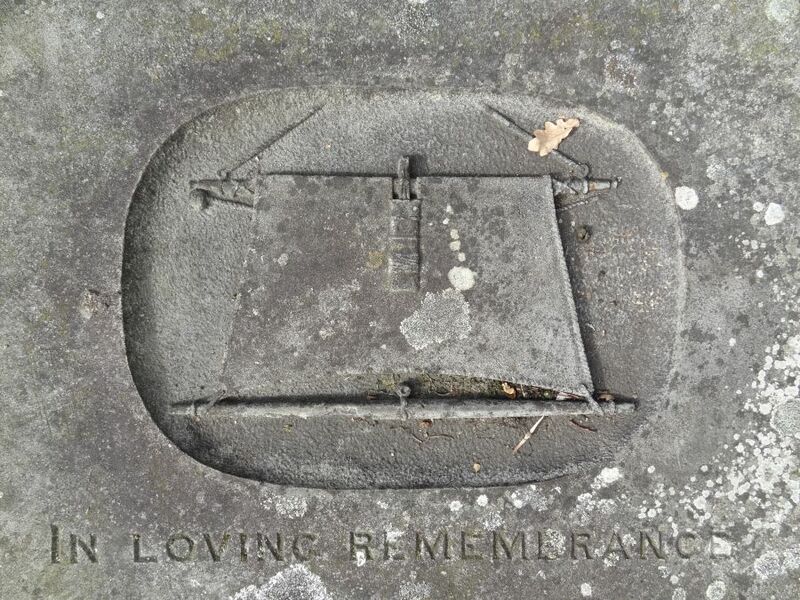 who married but died aged 47 tragically at sea with his wife, Eleanor Kate Cunningham and Col. Dacres Cunningham (baptised Mar 8 1854), who was in the Indian Army. Henry Hutt's son, John Cunningham, as Rear-Admiral John Henry Dacres Cunningham was made a companion of the Bath at the 1937 Coronation. He became Admiral of the Fleet and First Sea Lord from 1946 to 1948. I am grateful to H.D.P. Cunningham's great-grandson Frank Grenfell for supplying details of the family and for supplying and allowing the use of the two photographs of H.D.P. Cunningham. Various editions of The Times and local newspapers, Hampshire Telegraph and Sussex Chronicle. 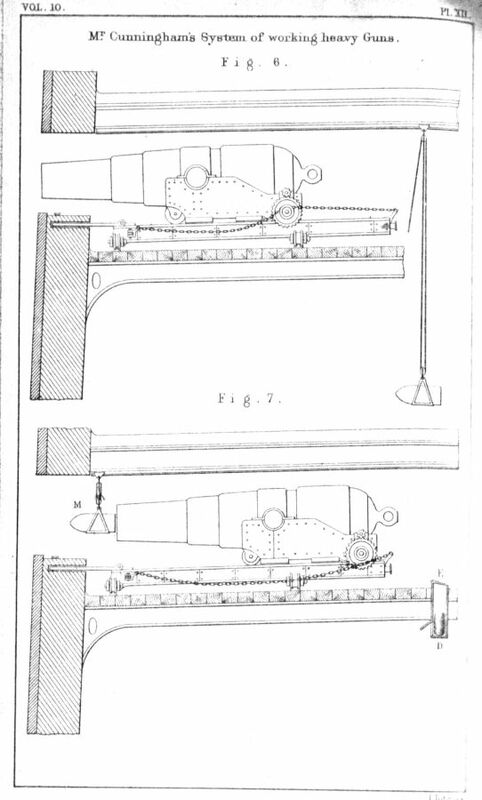 Journals of the Royal United Services Institute:1870 "Working Guns and Heavy Projectiles", Cunningham. Department of the Director of Artillery: List of Changes. H.M.S.O. "Report of the Committee Appointed to Enquire into the Construction, Condition and Cost of Fortifications Erected in 30.31 Victoria Statutes, Together with minutes of evidence. 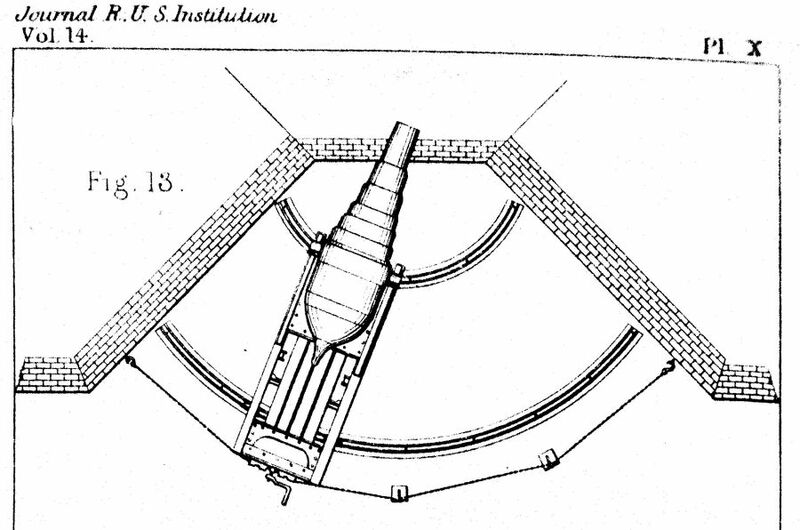 1868": Appendix V - "Record of experiments conducted at Gilkicker Battery on 29th. December 1868; and at Shoeburyness, on 11th. and 15th. February, 1869". Additional information by Philip Eley.